‘The Ape of Naples’ can be viewed as a memorial to Jhonn Balance following his untimely accidental death, a broadly indicative summing up of the work of Coil, featuring new versions of three key songs from their repertoire alongside other numbers, providing ample evidence that the introduction of marimba added depth and richness to the group’s work and indicating the direction that might have been more fully explored on future releases. ‘Fire of the Mind’ features an angelic choir and a slowly changing single note of music gradually transformed into a ballroom dance rhythm. The lyric explores the nature of death and the intimate metaphysical relationship between angels, men and animals. It ends with an extended chant, repeating the word ‘holy’ over and over again, set against a backdrop of what sounds like the blending of tabla and shenhai style English chaunter. ‘The Last Amethyst Deceiver’ is the first of the three key Coil songs. A calm and measured introduction gives way to the high-pitched sound of a ringing glass. The lyric is mournfully delivered and relates the tale of our mothers’ and fathers’ failure to encourage us to enter a world of wonder. Our future carries little promise; we are in thrall to the death sentence inherent in our earthly generation. ‘Tattooed Man’ is another street style ballroom dance tune, similar in some respects to ‘Fire of the Mind’. We hear an accordion melody underscored by marimba, shifting percussion and bass. This song is a lament for time wasted and gone, a song about impotence, self-love and self-hatred existing in three places at once through the agency of time. ‘It’s in my Blood’ is the sound of chemical uplift taking hold and merging with a downward tending heartbeat. Once a state of passable equipoise has been attained, we enter the heart of a marching rhythm before setting off on a circular dance. A somewhat aggressive, drug fucked, barbarous tongue tells us: ‘It’s in my blood stream’; there’s befuddled joy in the proclamation. Emotive violin and rising and descending brass briefly emerge to enliven the onward march before the song reaches its end. ‘I Don’t Get It’ is primarily a representation of the mellowing of the extreme drug experience depicted on ‘It’s in my Blood’; the starveling spirit has shouted out its pain and is comforted by a gentle balm. ‘Heaven’s Blade’ is about self-injury on a cosmic scale, inflicting a sacred wound and travelling through the opening. The song suggests hurting the flesh as a means of going beyond flesh and embarking on a journey from earth to sky to sun, transforming being through transcendent blood sacrifice. We hear the sounds of a distant nightclub at the start of the song, which proceeds to its sudden end through a charged ongoing dance beat. There’s a long pause before we come to ‘Cold Cell’, the second of the three key Coil songs presented on this album. The lyric is a kind of prayer, a plea for salvation from the everyday oppressions of the world, from limitation and judgement, which are the tools of ‘the devil’ of this song, ‘from hidden obligations’. Man in this world is imprisoned and the final restriction is death; ‘Cold Cell’ embodies the yearning of the temporal and death bound for the eternal. 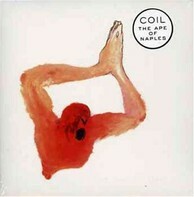 ‘Teenage Lightning 2005’ is a reworking of the third key Coil song featured on ‘The Ape of Naples’. It sounds like an artfully degraded recording of years gone by with a layer of new stuff on top of it, a gradual accumulation of electronic bleeps, whirrs and rattles alongside a staged distortion and extension of elements of the core tune. This version seems like a wistful memory of the youthful exuberance of the magical drugged night out described on Coil’s ‘Love’s Secret Domain’, an impression that is reinforced by the elegiac wind instrument and flute with marimba combination at end. ‘Amber Rain’ is a lament for ever departing life, in which the protagonist travels from dark sea to dark sea across a wasteland, limping beside a river of blood, every step an enormity. ‘Going Up’ starts off as another unhappy marching tune with an otherworldly chant in the background but ultimately it’s the story of an ascent and a mysterious transition that sees the marching rhythm dispensed with in the second part of the song, which ends with the barely audible assertion ‘It just is’ and the sound of a bottle set rolling on a smooth stone surface, a Coil device of longstanding, representing the passing of consciousness from one mode of being to another.